Silke Schmickl & Nathalie Parienté are pleased to announce their second presentation of HOW WATER, an exhibition project whose different developments are being presented in several steps. This second part of the exhibition HOW WATER will take place from July 2nd to July 28th 2012 at Platform 38 Wilson in Paris. It will present works by Masayo Kajimura and Johanna Reich that explore the symbolism of water in its metaphysical dimension: the intimate danger, the drowning, the disappearance, and the memory of water. Ahrenshoop #01 was shot during the artist’s residence at the artist house Lukas by the Baltic Sea in Northern Germany. 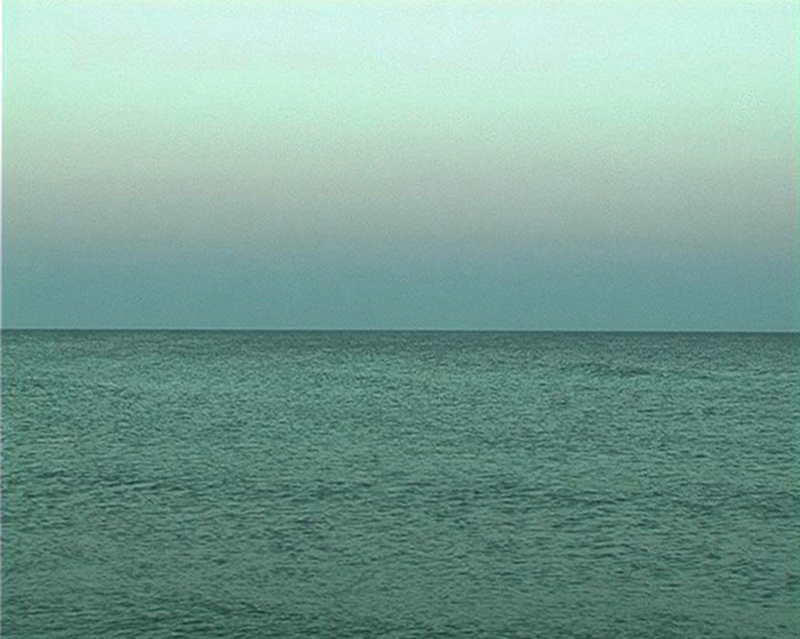 Only the sky and the sea of Ahrenshoop can be seen, which the artist filmed for one month every day. The tide, day and night, the moonset; an infinitely repeating process becomes a play of light. The video series “traveling time series” is an ongoing long-term project, where video sequences are created with images from different places and times collected over the years. Distant spaces and times are interwoven, the far becomes close, the presence dissolves in the flow of images. The movement within the image and timeline is a central theme of this series. Outside the sun is shining is a part of the video series “traveling time series” and was shot at the former Kurhaus (spa hotel) in Ahrenshoop at the Baltic sea in Northern Germany in spring 2008. Formerly a symbol of the corrupt GDR elite, the decayed building was pulled down in 2009, and is now replaced by a new building, a hollow glass construction of neo-capitalism. 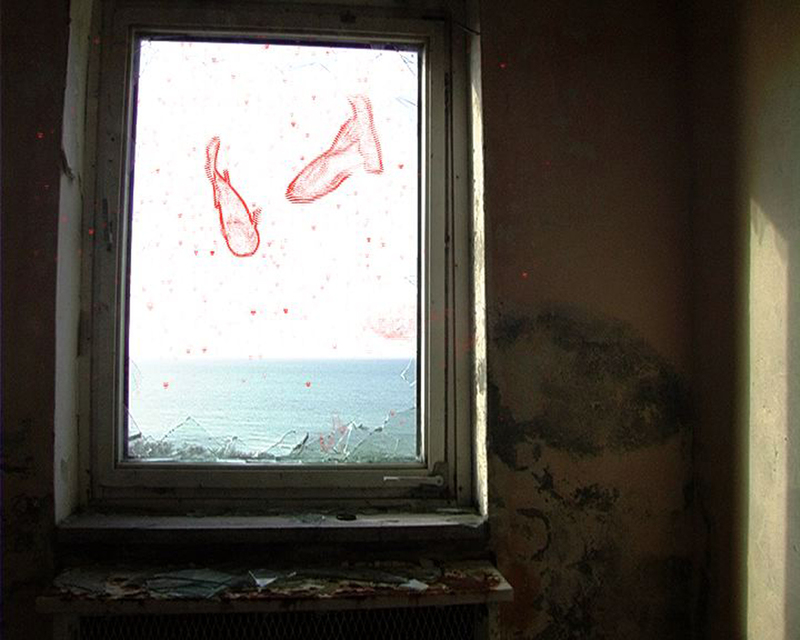 My view fell onto the empty rooms of the ruin. They were filled with poetry, as if this in-between state of decay had stories and inhabitants of its own. I decided to make these temporary inhabitants of the ruin visible. They are gone now, but what is left is the eternal view: the sea that I saw through the broken windows, which was shining in a warm blue light on this sunny spring day (Masayo Kajimura). What stories do we tell? And how do the stories form us? How do memory and (hi)story constitute our reality? Referring to the legend of the carp who becomes a dragon – a well-known story for every child in Japan –, the film moves on to the fishing of the salmon in Lil’wat, a Native Canadian Community. The traditional relationship between the salmon and the people is strongly connected to their unique sense of storytelling. Storytelling here is presented as a vital form of preserving memory, which becomes even more important for a minority surviving in a dominant culture. Parallel in the film, the ritual of wearing the kimono becomes a tool for reconnecting to memories and thus reinventing tradition in the diasporic experience of a Japanese immigrant in Germany. Using dislocated images and voices which overlap the images, the film questions our conception of the „Other“. 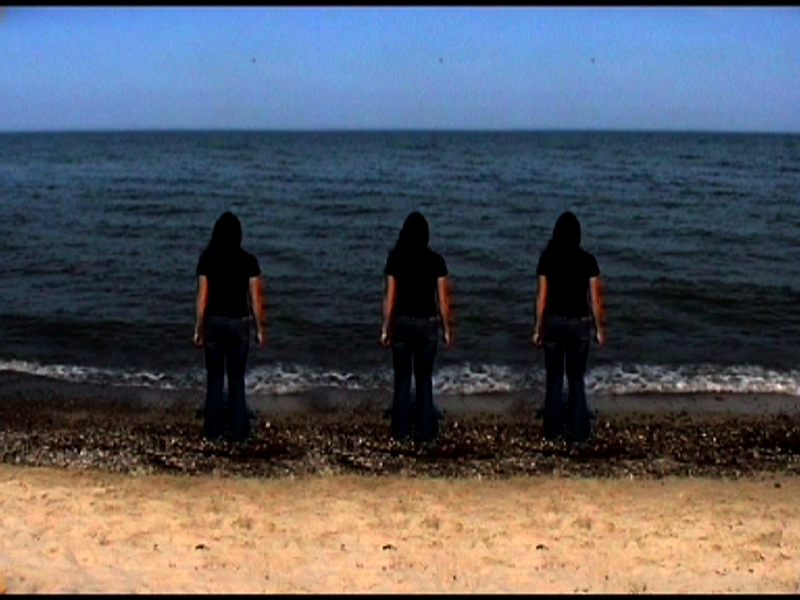 By connecting different realities and spaces, the film communicates the ambiguity and diversity of reality and perception. The camera lies in a puddle on the ground and films the surroundings and the reflection of the surroundings on the water’s surface. 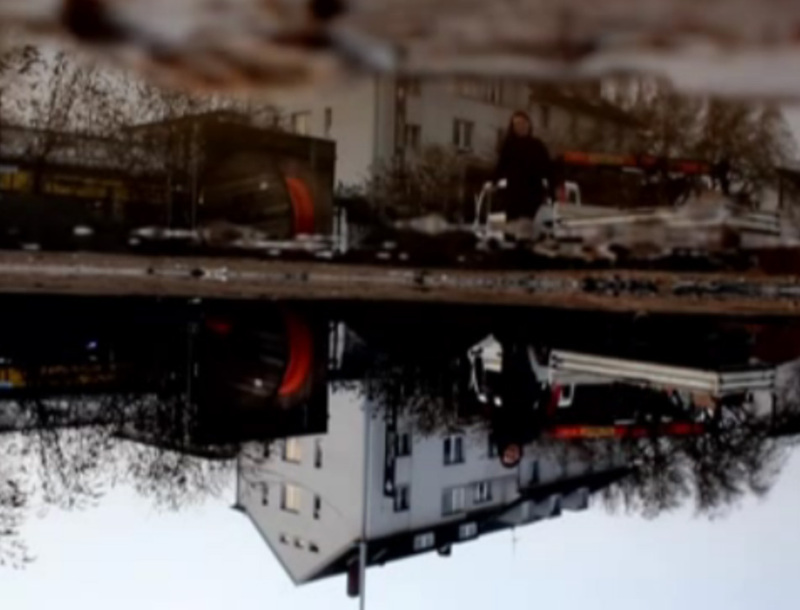 The artist runs towards the camera and jumps into the puddle thus destroying the mirrored image. The camera lying in the water is rotated by 180°. 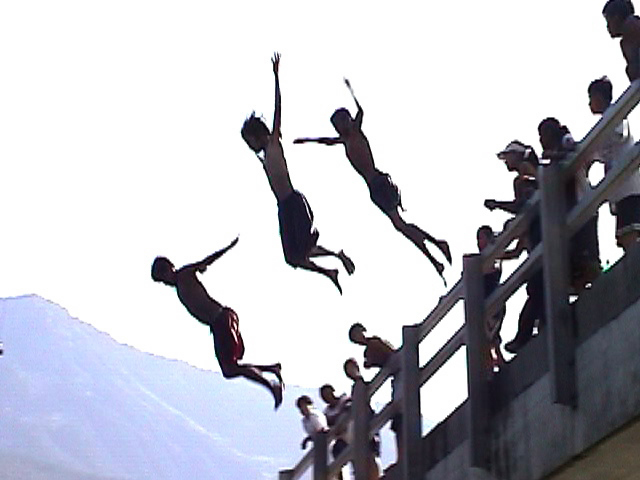 As a result, the image above and not the image below is destroyed at the moment of the jump. Three persons are waiting at the seaside, a small community of three identical women. 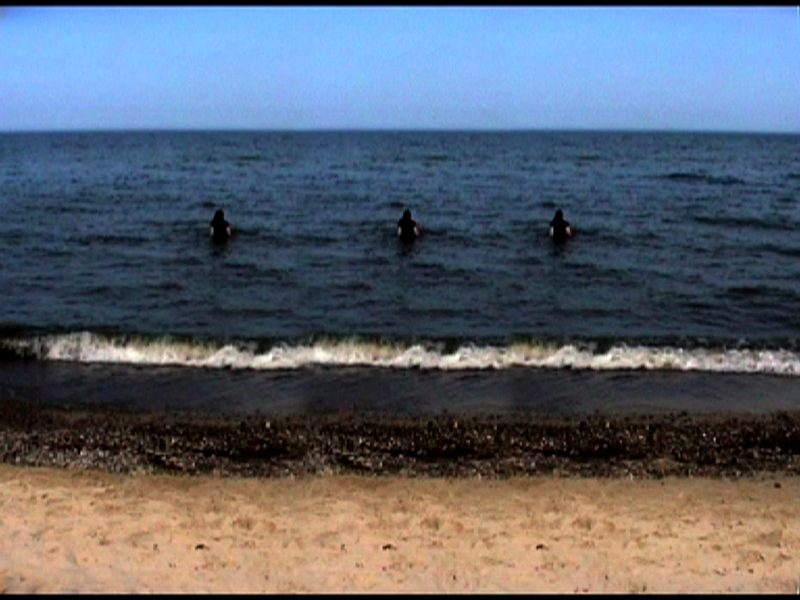 They simultaneously walk into the water, mechanically entering the sea. Like being controlled by an invisible power they straightly walk into the water until they vanish.